A proud head coach poses with the State Championship Kindergarten team from MSJE. 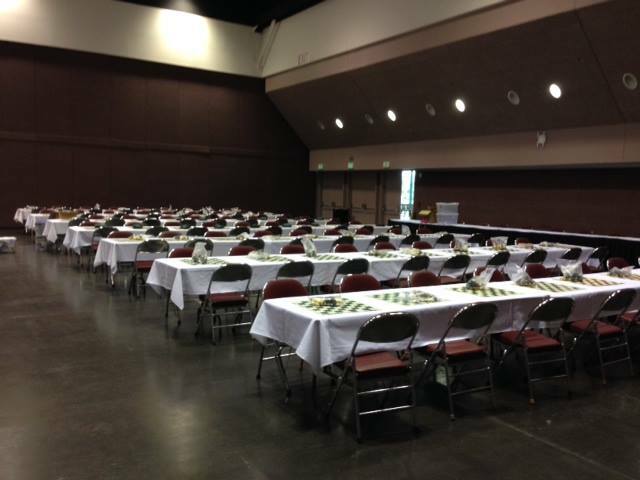 The 2014 Northern California Scholastic Chess Championships were held the weekend of April 26th and 27th at the Santa Clara convention center. Over 600 students and more the 50 schools competed in these championships. Mission San Jose Elementary school (MSJE) of Fremont was the big winner in the Elementary School Division. MSJE swept all of the Championships sections and won many of the Junior varsity sections and rookie sections. The closest and most exciting championship was the Kindergarten (K) section. Saint Marks School of San Rafael entered a nine player team in the K section. The MSJE team won first place with 13 points versus 12.5 points by Saint Marks. St Marks has been a scholastic powerhouse for more than 25 years. Shreyas Jay lead the MSJE team with four wins out of five games. Shreyas won his first four games and was playing for the state championship in the last round. Shreyas lost in the last round but he still tied for third place. Siddharth Arutla, Ayaan Kassamali, and Yiwen Gong each scored three points and tied for 12th place. Jolene Liu, Zachery Easow, Vivdh Goenka, and Jasper Li also competed for the team. All of our kindergarten students won trophies. The top elementary school section at these championships is the 4-6 Championship Division. MSJE won the section with 18.0 points versus 11.5 points for the second place school. (Bullis Charter school of Los Altos.) MSJE also beat all of the chess clubs (Teams made up of players from numerous schools) in this section. The individual 4-6 championship came down to two MSJE players. 3rd grader Rishith Susarla (Who was “playing up” in the 4-6 section) was in second place with four wins and a draw. David Pan was in first place with five wins. Usually teammates do not play each other, but this prohibition is eliminated in the last round for the top players. David won the final game vs. Rishith to finish with a perfect 6-0 score and won the individual Championship and the title on Northern CA Elementary School Chess Champion. Rishith tied for fourth place. Annapoorni Meiyappan (another third grader playing up) scored four points, won a trophy, and tied for 9th place. Kevin Zhu scored 3.5 points and won a trophy. Andy Tong, Max Wang, and Sriram Bharadwaj also competed for the MSJE 4-6 Championship team. 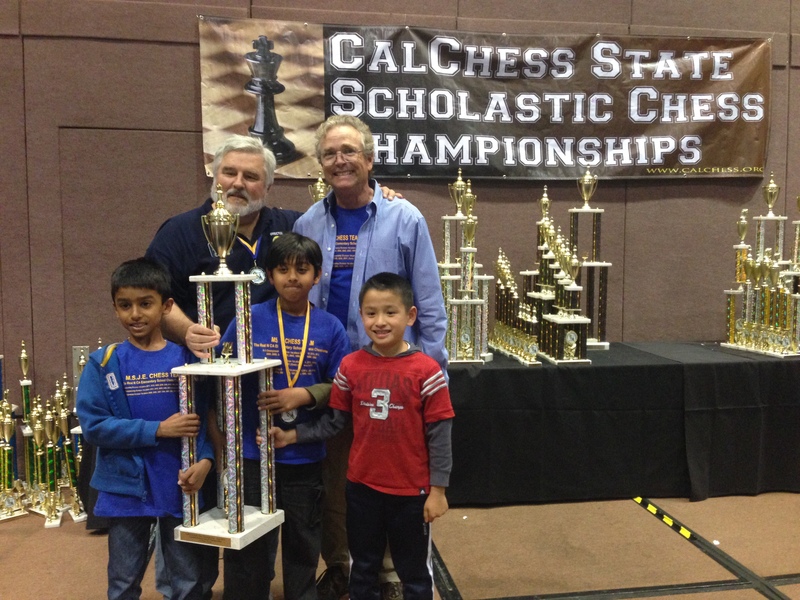 Calchess President Tom Langland with MSJE head coach Joes Lonsdale and the k-5 State Championship Team from MSJE. The 4-5 Championship section was also won by the MSJE team by a large margin. MSJE scored 16.5 points versus 6 points for Marin School of Marin the second place school. This score tied MSJE with the first place club, Berkeley Chess School. Berkeley Chess School runs chess programs at more than 50 schools and their team is an all-star team from these schools. Kavya Sasikumar was top scorer on the MSJE K-5 team. Kavya scored five wins in six games and tied for second place. 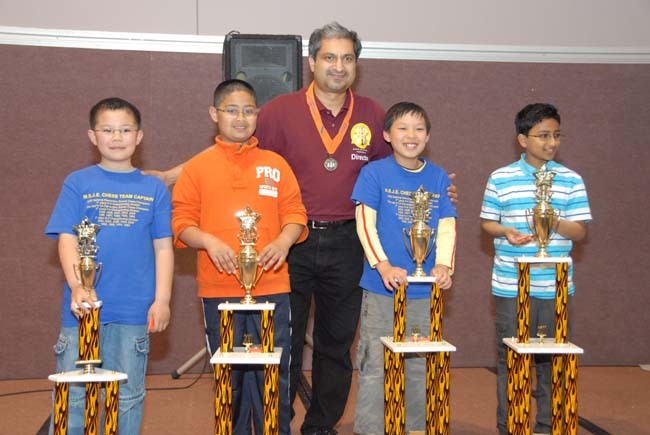 Jeffrey Liu and Mihir Bhuptani each scored four points, tied for seventh place, and won trophies. Jaisuraj Kaleeswaran scored 3.5 points and Alex Liu scored 3 points. Both Jaisuraj and Alex won trophies. The 4-6 JV (junior varsity) section is for players with ratings below 800 and above 500. The top 12 MSJE players were playing in 4-6 championship or 4-5 championship sections. None of the competing schools in the 4-6 JV section had more than one or two players in the championship sections. Also MSJE only had three players in the 4-6 JV section. The team score is the sum of the scores of the top four players on each team. Despite these handicaps the MSJE team of Siddharth Mukherjee, Alvin Lee, and Nivedha won the first place team trophy in 4-6 JV. Siddharth scored a perfect 5/5 and won the first place trophy. Alvin scored 3.5/5 and won the 7th place trophy. Nivedha scored 3/5 and won the 23rd place trophy. The 4-6 rookie section is for players that do not have a rating. There were several three and four player teams in this section. Saharsh Goenka and Kevin Ma were the only two MSJE players in this section. Kevin and Saharsh won all of their games until they had to face each other in the last round. (Again the prohibition against team members playing is removed in the last round for the top of the ladder.) Saharsh won the all MSJE game and the first place trophy. Kevin tied for second place with four wins. MSJE won the first place team trophy in the 4-6 rookie section. I believe that this is the first time that a two player team has won first place in any division. MSJE won the K-3 Championship section with 15 points versus 9.5 points for second place Gomes Elementary of Fremont. Kevin Pan won his first five games and was playing for the individual championship in the last round. Kevin lost the game, but still tied for second place and won a large trophy. Atul Thirumalai scored four points, won a trophy, and tied for 8th place. Leo Jiang, Stephen He, and Amulya Harish scored 3 points, won trophies and tied for 25th place. Allyson Wong, Arnav Lingannagari, Edwin Thomas, Henry Liu, Shree Jay, and Maxwell Yu also competed for the K-3 Championship team. 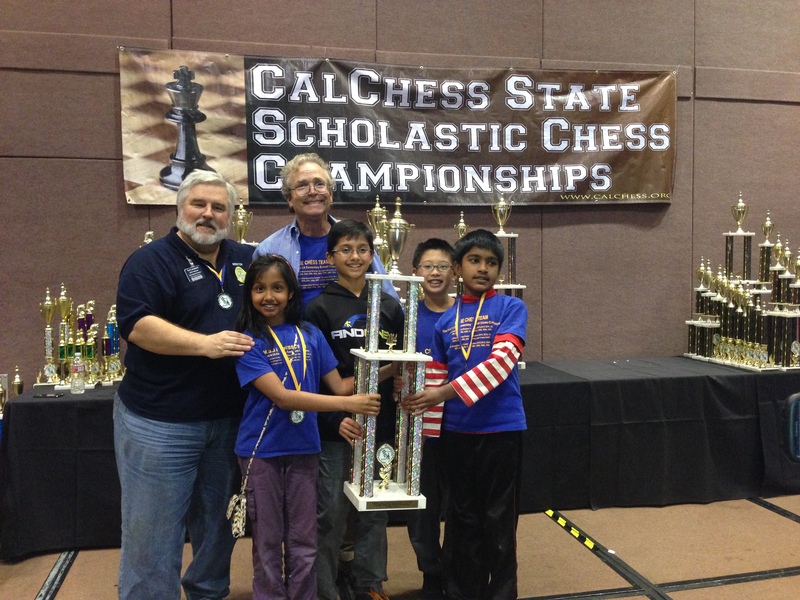 The k-3 Calchess State Champions from Mission San Jose Elementary School. The 1-3 JV section is for players with ratings between 500 and 799. MSJEs top 13 1-3 players were playing in higher sections (4-6 Championship and 1-3 Championship). Most of the schools competing in the 1-3 JV section had very few students playing in higher sections. MSJE won the 1-3 JV section with 13.5 points vs. St Marks with 10.5 points. Nicholas Jiang won his first four games and was playing for first place in the last round. Nicholas drew his game and finished in second place. Vasu Rao, Dhruv Susheelkar, and Carolyn McNay scored three points, tied for 13th place and won trophies. The 1-3 beginner section is for players with ratings under 500. Vaibhav Wudaru won all five of his games and tied for first place. Evan Yang and Jack Lee each won three games and won trophies. Suhan Khan, Lillian Ma, Soham Patti, and Varun Rao also competed for our 1-3 beginner team which took the third place team trophy. The 1-3 rookie division is the division for players that have not played in a tournament before. Sandeep Salwan tied for first place in this section with 5 wins out of five games. 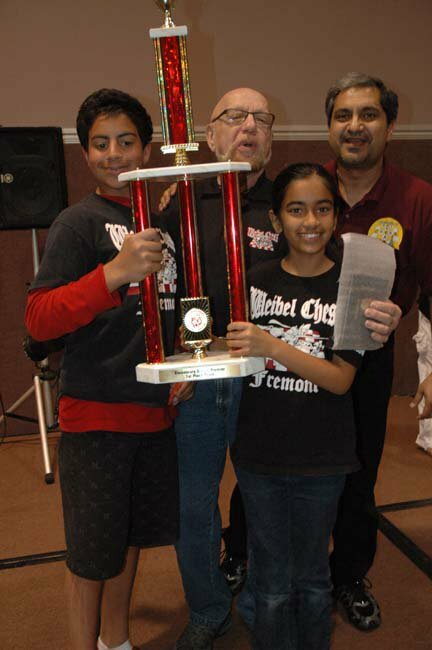 Monish Jonnadula and Aditi Sagi each scored 4 points, tied for fourth place and won trophies. Chris Liu also competed for our 1-3 rookie team which won the first place team trophy. Congratulations to the MSJE chess team for a great result at the State Championships. In two weeks much of the team will be in Dallas competing in the Elementary School National Championships. Don’t forget to sign up for the annual Fremont Summer Chess Camp at MSJE. 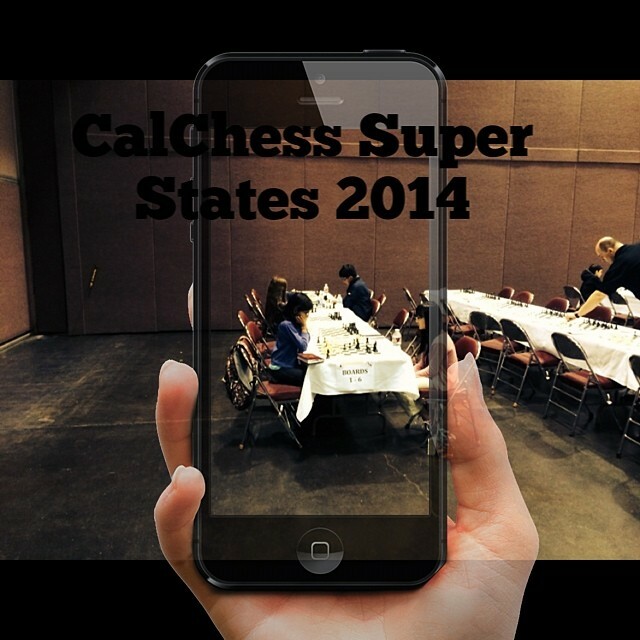 The first day of the 2014 Calchess Super States is complete. Tournament directors, players, coaches and parents can relax for a few hours before chess battles starts again in the morning. Below, I give my readers a brief recap of the day’s highlights as well as some photographs I took when I wasn’t analyzing students’ chess games. For the first time ever, the Calchess Scholastic State Championships was run by a woman and she did the best job I have ever witnessed in my sixteen years of attending. Congratulations Judit Sztaray on a job well done and good luck with tomorrow’s rounds. Mission San Jose Elementary School dominated the field in all the elemnetary aged sections on day one of the Joe Lonsdale(k-6) Championship. 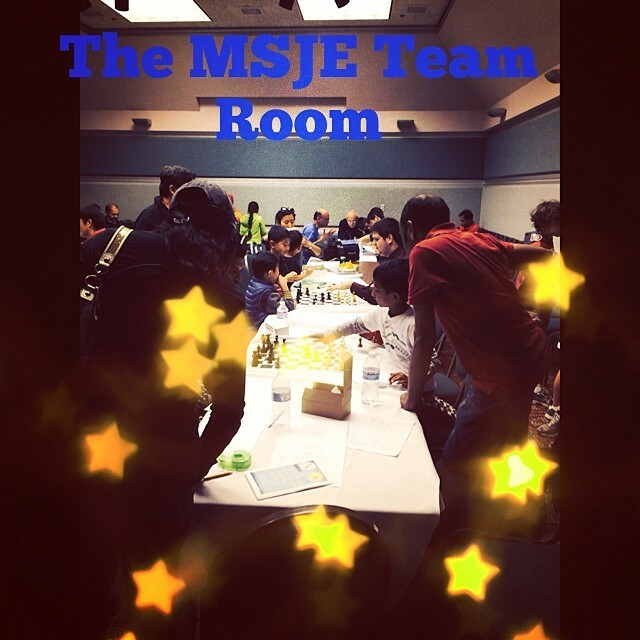 MSJE is again proving itself to be the best program in Norcal chess. 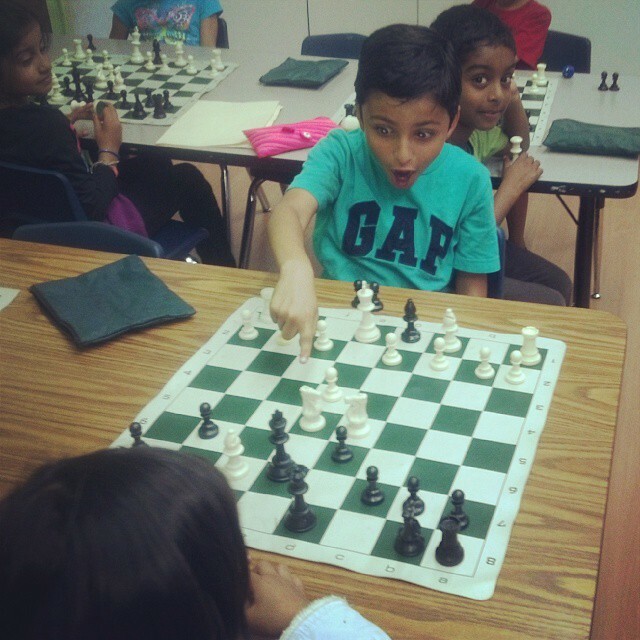 The Fremont Summer Chess Camp at Mission San Jose Elementary School is a once in a lifetime opportunity for your child to take classes with the best chess teachers in the United States and train with the 2013 National Elementary Chess Champions. 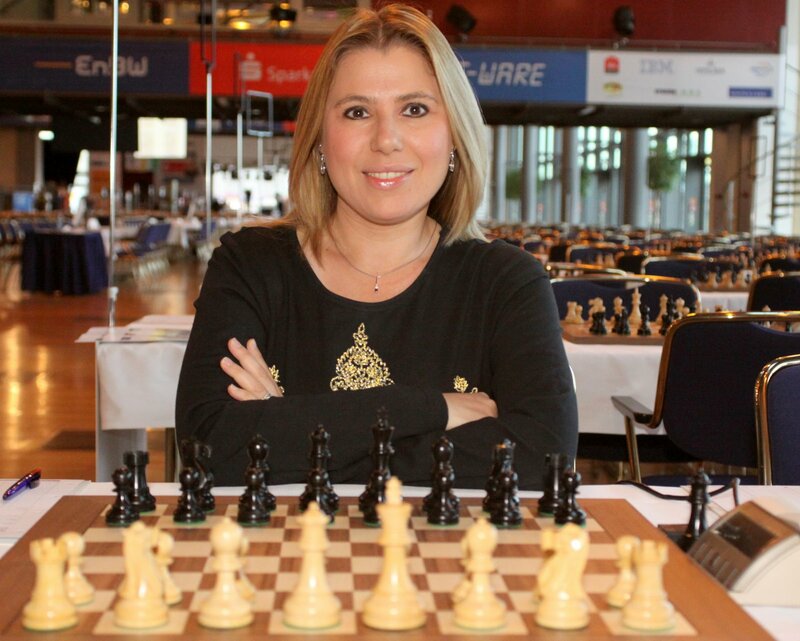 This year, our camp will also feature instruction from GM Susan Polgar as well as many other distinguished special guests. The Fremont Summer Chess Camp at Mission San Jose Elementary School is filling up quickly, so be sure to sign up soon to ensure a spot for your child. Joe Lonsdale takes a moment to enjoy another Championship with MSJE students. 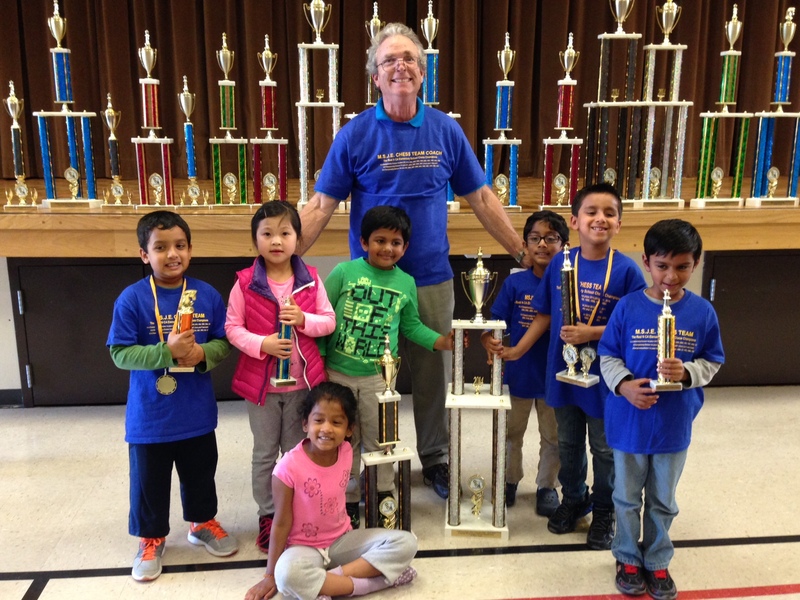 Joe Lonsdale established the Mission San Jose Elementary School Chess team in 1990 for the benfit of his oldest son and has been running the program ever since. Mission San Jose Elementary School has made a habit of winning almost every State Championship title in California that they are eligible to play for and Joe’s success as the MSJE head coach is really what put Fremont Chess on the map. In fact, Joe has lead the MSJE chess team to more state championship titles than all the other schools in Northern California combined. So it is fitting that, this year, to honor Joe’s unparalleled success as a scholastic chess coach, Calchess has decided to rename the Calchess Elementary Scholastic State Championship after Joe Lonsdale. 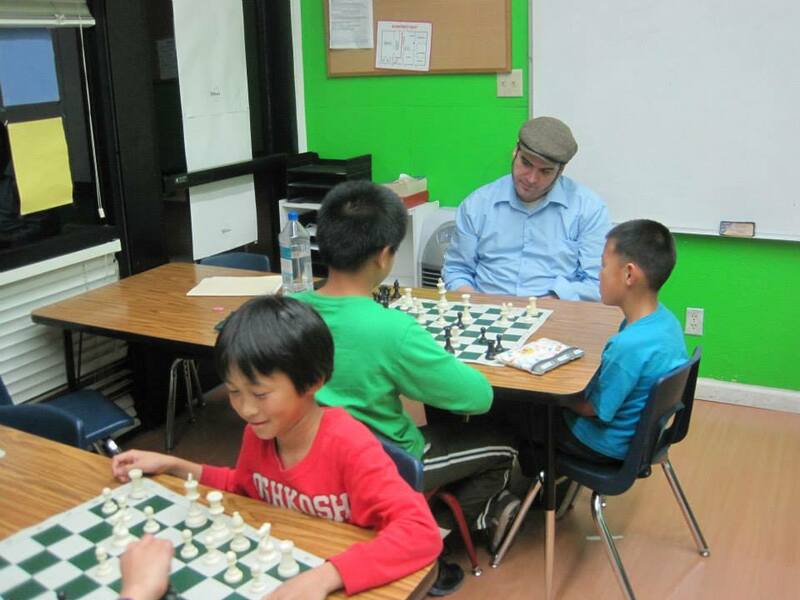 After coaching his students all weekend long at the state championship named after him, Joe Lonsdale will take a short break from his chess instructing obligations before showing up to the Fremont Summer Chess Camp at Mission San Jose Elementary School. On a daily basis during the month of July, Joe Lonsdale will make sure his students are preparing for the next school year’s chess battles. It is this kind of dedication from a head coach that is the main reason that Mission San Jose Elementary School has been the best school chess program in Northern California for decades. Joe’s influence on Norcal chess extends well beyond Mission San Jose Elementary School and children from any school or club are more than welcome to register for the Fremont Summer Chess Camp at Mission San Jose Elementary School by visiting the Torres Chess and Music Academy online. 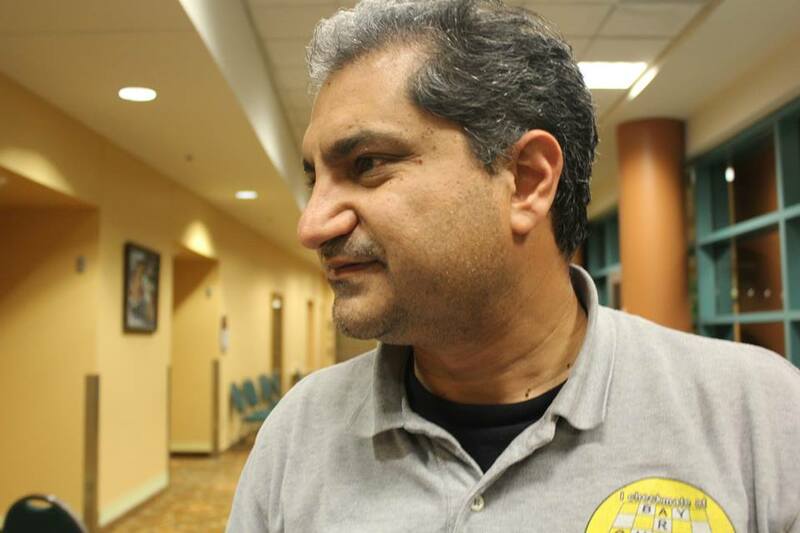 Salman Azhar returns to organize the Calchess Scholastic State Championship for a record setting seventh straight year! This year’s tournament has some changes in schedule and structure that I would be remiss if I did not mention. The most apparent change is that the Calchess Junior High State Championships will take place two weeks before the main event in order to allow for Middle School Aged Students to attend the National Junior High School Chess Championships. Another development to be aware of is that all championship sections, excluding kindergarten, will play a two day event in order to allow the higher rated chess players more time to play better chess. However, players of all ages who have lower ratings will only be required to show up for one day of competition. This makes sense because less experienced players tend to play faster and have less time to devote to chess. This year’s k-6 section will be named the “Lonsdale Championship” after the MSJE head coach, Joe Lonsdale. The Torres Chess and Music Academy will once again be encouraging all of it’s students to participate in this event. For decades, Mission San Jose Elementary School (a Torres Chess and Music Academy program) has been the most dominant school at the State Championship and this year’s k-6 section will be named the “Lonsdale Championship” after the MSJE head coach, Joe Lonsdale. For more on Joe Lonsdale and Mission San Jose Elementary School’s successes please visit www.ChessAndMusic.com or search past articles on this blog. 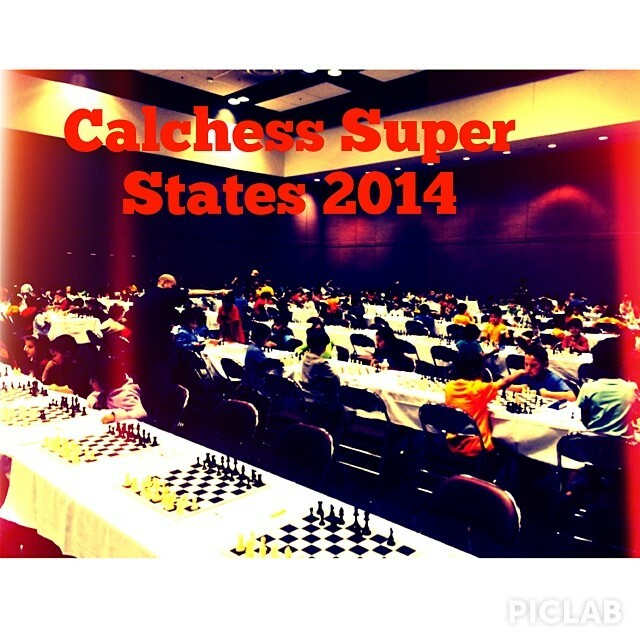 Below is the official schedule for the 2014 Calchess Scholastic State Championships. If your child is lucky enough to be a student at a Torres Chess and Music Academy program you can just download the correct application from this page and submit it to your child’s chess coach. I will personally make sure that your child is placed into the correct sections. If you are not affiliated with TCAMA you should visit www.Calchess.org and apply online. For more information on this tournament, please visit www.Calchess.org.